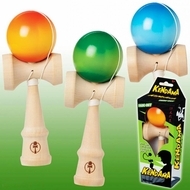 This Fade Out style deluxe Kendamas measure 7 inches tall, are made of solid wood, and are individually packaged. Each bright ball colors with fade-out starburst effect. Colors may vary. One per order. Made by Toysmith.